Mt. 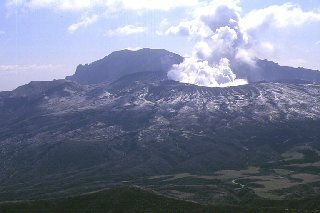 Aso is a composite active volcano located in the northwest of Kumamoto Prefecture. In the middle, there are so called "Aso Gogaku" which are andesite central peaks and composed of Mts. Taka, Naka, Neko, Eboshi and Kishima. Mt. Naka has a great crater which is still active. The highest peak Mt. Naka is1592m high and owns many rock-climbing grounds rare in Kyushu. Mt. Naka is the currently fuming peak. In old time, the people have respected it as a holly mountain and called the crater Shinrei-ike (Sprit Lake) or Mi-ike (respectful Lake). Each time there was an explosion, they had trembled with the fear of a god's anger or an evil spell. The great explosion of the 28th year of Showa Era made a great number of dead and heavily injured. The caldera surrounded by the outer ring is the largest of the world and streching18km to the east-ouest and 24km to the north-south direction. It is divided into the northern valley of Aso where runs Kuro River (Black River) and the southern valley of Nango where runs Shira River (White River). The inside of the caldera is included in Aso-Kujyu National Park and you can go up to Mt. Naka by a ropeway. Once upon a time, after a great volcanic explosion, Mt. Aso sank over a huge area except for the outer skirt. Soon the waters filled up there and made a lake, whole over the inside of the outer-ring. Prince Tateiwatatsu planned to create a rich cultivable country by pouring out the waters. When he gave a kick to the mountain, it collapsed down instantaneously and the waters rushed out from the newly created hole. Note: The demo users can download only the first 5 exercises. Please refer to the list of exercises for the details.